For those of you that are new to the term “safe beauty,” you may be wondering: what’s all the fuss about? Was this term created to cause yet another health panic? No, but it’s worth understanding so that you can make better decisions about the beauty products you use. My background in Environmental Studies has always made me consider my ecological footprint when making purchasing decisions of any kind, so naturally my choices in beauty products are no different. In addition, I’ve always had adverse reactions to fragrances (headaches, nausea), and after having a family and being more responsible for keeping our home tidy and sanitary, I also realized that I would get headaches after cleaning as well. I started to make a connection to the artificial fragrances found in cleaning products (not just my extreme distaste for cleaning, lol). When I became involved in the beauty industry and was exposed to more products, I found myself favouring the ones that felt lighter on my skin, as opposed to those with “long-lasting” pigments or staying power that many other make-up artists seemed to prefer. As I started to educate myself on the ingredients and their potential side effects, what I learned shocked and disturbed me: Many of the harmful chemicals in these products have been linked to cancer, reproductive issues and hormone disruption. No one should ever have to sacrifice health for beauty! The U.S. has not passed a federal law to regulate ingredients in personal care products since 1938. 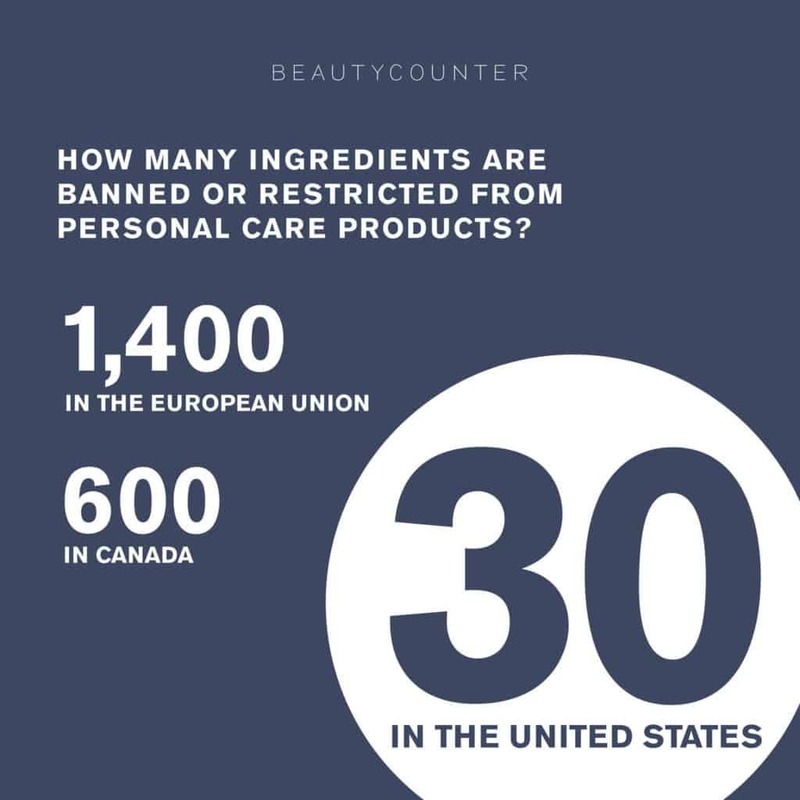 In the U.S., only 30 ingredients are restricted or partially banned from cosmetics. The European Union has banned close to 1400. The Federal Canadian Government currently prohibits less than 600 substances for use in cosmetics through Health Canada. Chemicals in personal care products may poison water supplies. Two major culprits are 1,4 -dioxine (commonly found in shampoos and soaps) and parabens, which are washed down the drain through products like shampoos, and facial and body washes, are not biodegradable, leach into ground water, and ultimately contaminate drinking water. So, what can be done in support of safe beauty activism? The good news is there are safer products out there, but again you must take responsibility when making your purchasing decisions and do your research. Many products are labelled “natural” or “organic,” and in some instances there may be one ingredient in the product that may be one of those two things. However, that product may still be loaded with chemicals that the company is not compelled to divulge to you, due to lack of regulation. We are a Green Circle Salon! Green Circle Salon is the beauty industry’s pathway to sustainability. They are innovators, pioneering truly sustainable solutions for repurposing, recycling, and capturing 95% of salon and spa waste. We offer Beautycounter – a safe but high-performing cosmetic and skin care alternative – to our clients. Beautycounter has a list of 1500 ingredients that will never be used in their products, called “The Never List”. If you are ever in doubt about the products you are currently using, take the time to research on the Environmental Working Group website. Also keep in mind that we are here to support you when you are ready to switch to safer products, and are happy to customize a make-up, skincare and hair care routine just for you. We will also donate your gently used personal care products to 360 kids hygiene rooms if you’d like. So, what do you think? Is safe beauty worth the attention? What’s all the fuss? We’d love to hear your thoughts in the comments!